Nobody knows anyone. The insoluble mystery of “other people” is the subject of plenty of films, but rarely in recent memory has it been so potent a driving force as it is in Phoenix. Here’s a drama that starts off with a seemingly simple conceit but eventually grows more and more troubling—and fascinating—into a critique of collective moral blindness and an up-close examination of marriage. The latest from German filmmaker Christian Petzold, Phoenix works best for all the answers it doesn’t provide, honoring the mysteries of everyday life rather than explaining them away. The film takes place in Berlin in 1945, as the nation is reeling from the aftershocks of World War II. Nelly (Petzold regular Nina Hoss), a Jewish singer, is a survivor from the Nazis’ concentration camps, her heavily bandaged face a visible sign of the untold horrors she’s witnessed. Reunited with her friend Lene (Nina Kunzendorf), who longs to leave Germany behind and move to Palestine, Nelly requires reconstructive surgery, deciding that rather than remaking her face, she wants to look the way she did before the war. But the rehabilitation doesn’t end there: Nelly is on the lookout for her husband, a piano player named Johnny (Ronald Zehrfeld). Lene is convinced that Johnny, who isn’t Jewish, ratted Nelly out to the Nazis, an accusation Nelly doesn’t want to believe. But when she does find him, he (like the bombed-out Berlin) seems mostly concerned with picking up the pieces and putting some distance between himself and the past. Intriguingly, though, he doesn’t recognize his wife: Assuming that she died in the camps, he’s merely floored by the vague similarity between this stranger in front of him and Nelly. Rather than revealing herself, Nelly plays along with a scheme he hatches, which involves tricking others into believing she is Nelly so that they can split the woman’s unclaimed fortune. There are obvious echoes of Vertigo in what Petzold, working from the book written by Hubert Monteilhet, is attempting with Phoenix. Around her husband, Nelly pretends to be someone else pretending to be her. Her complicity in his plan is, in part, an undercover operation to determine if Lene is right—Did Nelly’s beloved husband betray her in order to protect himself?—but it also provides her with an opportunity that perhaps plenty of spouses would love, to find out what Johnny really thought of her while she hides safely in plain view. As in Petzold’s previous films (Jerichow, Barbara), Phoenix is a bone-dry drama that could become a thriller if its maker wanted to embrace the material’s inherently pulpy qualities. Instead, he favors a more ground-level realism, which gives the story’s twists enhanced surrealism. As played by Zehrfeld, Johnny is a painfully ordinary man whose sense of guilt is as closely a guarded secret as whether or not he actually recognizes his wife. Considering that we never saw Nelly before the war, we have no idea how closely she resembles her old self, but because Johnny sees the similarities, there’s a lingering tension surrounding the possibility that she’ll ever do something that inadvertently makes him realize the truth—and, if so, how he’ll respond. Initially, Phoenix risks being merely a well-made but overly symbolic drama. Nelly’s reconstructive surgery; the fact that the bar where they meet is called “Phoenix”: These are but two of the obvious tips of the hat to the film’s themes of reinvention and burying the past. But once the plot takes over—with Johnny coaching Nelly in how to be more like Nelly so as to fool her family and their friends—the film grows more beguiling, the layers of deception and role-playing increasing. Is Nelly falling into this role of becoming “Nelly” so that she can stay with Johnny, who maybe conspired in her capture? And does Johnny want to turn this woman into “Nelly” partly because of his guilt—or does he simply see her as a chance to cash in after the horrors of war? In a more pedestrian telling, Phoenix’s mystery would simply be one long, drawn-out question waiting to be resolved. Did he betray her to the Nazis or not? But Petzold and his actors, while focusing on that question, always seem to be looking beyond it. It’s not long before Phoenix transcends the whodunit to become a precise study of denial and the barriers we put up between ourselves and those closest to us. Hoss is remarkable playing a woman who isn’t there, neither the Nelly of the past nor a person with a new identity. (This is all the more riveting since we can only guess who Nelly once was—there are no flashbacks, only the uncertain present.) Nelly starts off the film wrapped in bandages, but just about everyone in Phoenix is wearing some kind of mask, revealing nothing. 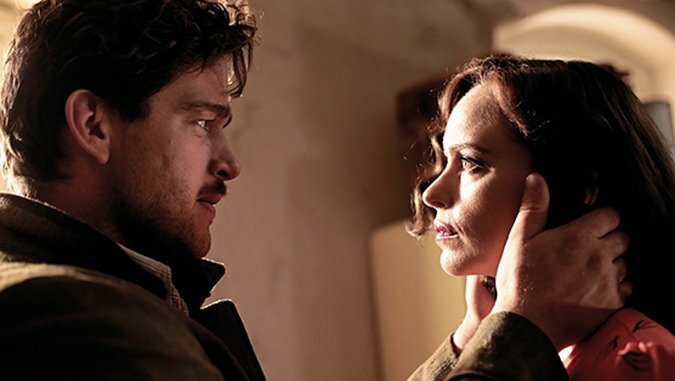 On one level, Petzold is criticizing his homeland’s matter-of-fact rejection of its shameful past, but his movie’s exploration of guilt, opportunism and casual emotional cruelty resonates far beyond Germany of the 1940s. The intimacy of Phoenix’s tale brings this societal critique right into our bedroom, exposing all the ways that marriages are their own form of subtle betrayals and self-preservation. Your beloved can be standing right there in front of you all the time—and yet, how confident are you that you even know what that means?